JKD has several projects underway at any one time. Follow our feed for updates and images during the design development & construction. 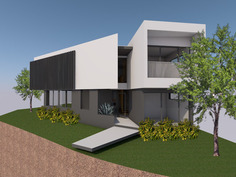 Concept Development is well progressed for this new family home in Sydney's South West. The home is located on a corner lot in a new residential sub-division, and takes full advantage of it's excellent orientation . Being a prominent site, the design is intentionally bold, with careful attention to providing privacy for the residents. The home accommodates four generous bedrooms with all living areas looking onto a north facing courtyard. Work is almost complete on this two storey home in Leichhardt with the owners due to enjoy their first Christmas in Leichhardt. Situated on a typical inner west street, with predominately cottages all around, the home fits comfortably with its neighbours, even though it accommodates four bedrooms and generous living areas which flow out into the deep rear garden. This new home at Shearwater, Greenhills Beach, has been approved by Sutherland Shire Council with construction on site scheduled to commence in August 2017. Featuring 4 generous bedrooms and lux living spaces, the home takes full advantage of northern orientation to the rear, with open indoor and outdoor living rooms overlooking a semi-inground swimming pool. Work is completed and the new owners have moved into their luxury apartments in Cremorne. Work is well underway for this new three storey home in Sydney's southern beach suburb development 'Shearwater'. Featuring curved cantileved balconies, generous north facing living spaces and roof garden, this home will be a standout for the area. Looking forward to seeing the concrete formwork being stripped and the sweeping curves revealed. UPDATE: Work has completed on this remarkable residence expertly finished by Wynn Homes, looking forward to getting images soon. A development application has been lodged with Northern Beaches Council for this new three storey home in North Curl Curl. Accommodating four bedrooms and dual living areas. Located in a flood zone, the innovation design allows for large parking areas with upper levels taking advantage of killer beach and ocean views.